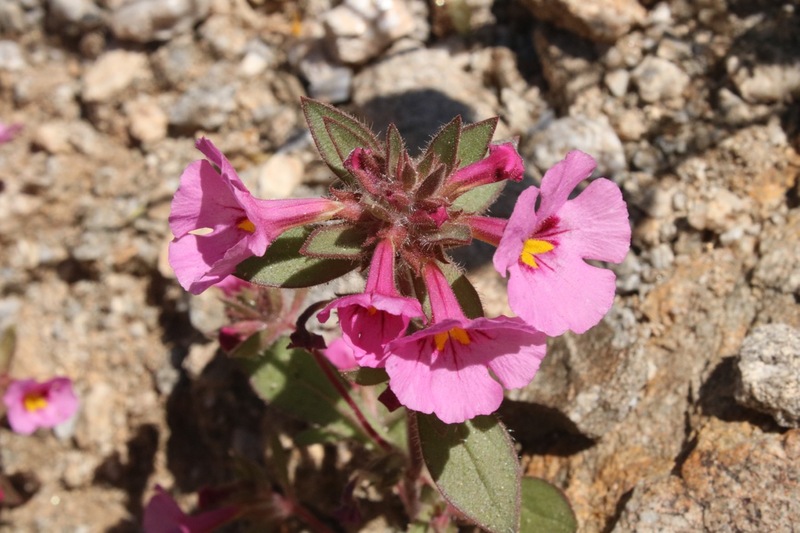 I kept my eyes open throughout Death Valley for signs of wildflowers. It was one reason why we wanted to visit. Last year, the national park experienced a superbloom that happens once in a blue moon because of specific environmental conditions. It’s not enough that California got literally drenched this January and February, a record downpour that broke a years-long drought, certainly grounds for optimism. A park ranger told me that a good rain in October is a prerequisite for a great flower display. One that happened in October 2015 led to the superbloom of 2016, only rivaled before then in 2005. It didn’t happen this year. Flowers were barely to be seen anywhere. Big disappointment, to say the least, but of course Death Valley has much more to offer than flowers. 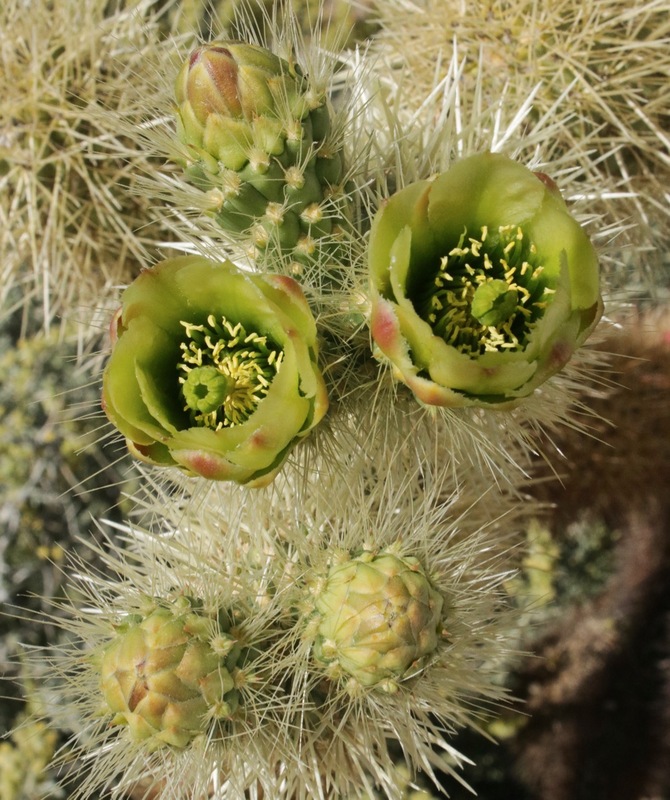 Meanwhile, the internet was abuzz with reports that Anza-Borrego Desert State Park, located northeast of San Diego near the Mexican border, was in fact experiencing a superbloom unrivalled in years. 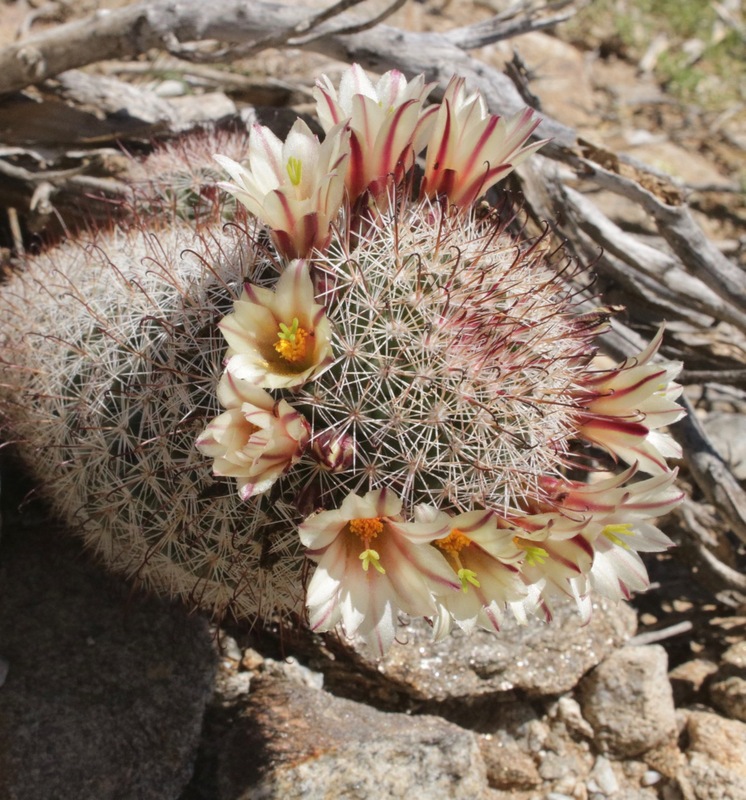 DesertUSA, which reports on Southwest wildflower displays, gave Anza-Borrego an almost perfect ’10’ rating, while Death Valley managed only a ‘4’ during the same time. That pretty much settled it. I saw this as an opportunity not to be passed up. My wife and I decided to make an unplanned visit, with an overnight stay in Borrego Springs (which I was very lucky to get as there were no other vacancies anywhere). We weren’t let down this time. The timing couldn’t have been better; the flowers were barely beginning to fade. We entered the park through Montezuma Valley Road (S22) on the west side. 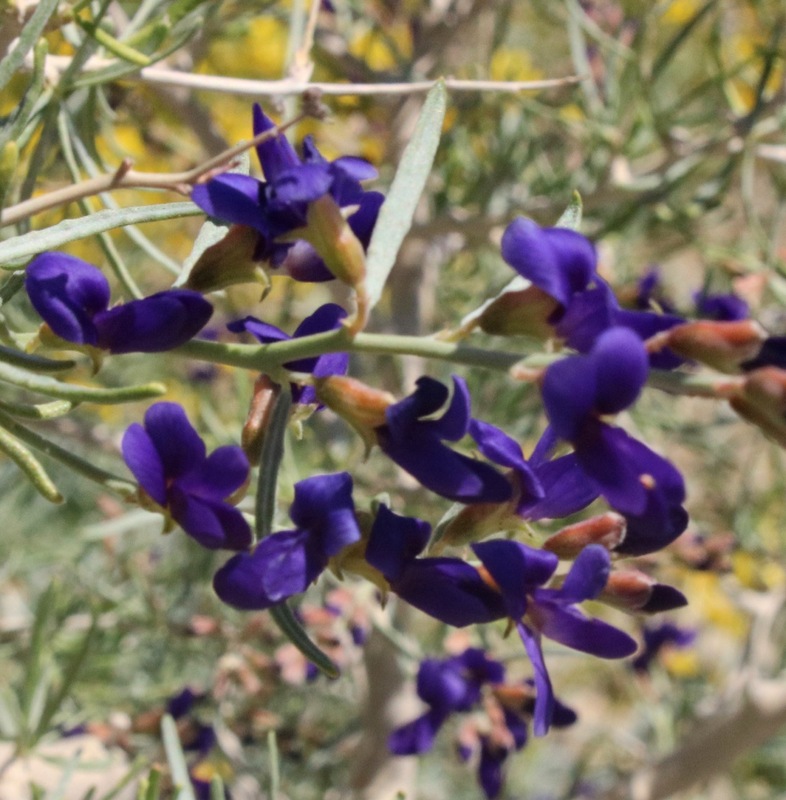 Intending to go to the visitor center, I made a wrong turn onto Hwy 78 toward Tamarisk Grove Campground when we came across hillsides covered in brilliant yellow brittlebush, hummingbird bush, ocotillo and a few less conspicuous. The moment was breathtaking, as it was for other passersby who likewise gawked. A fellow visitor informed us that a herd of bighorn sheep was seen at the ranger station down the road. It was pointless to jump in the car; the animals would have long been gone by the time we got there. We continued on Hwy 78. 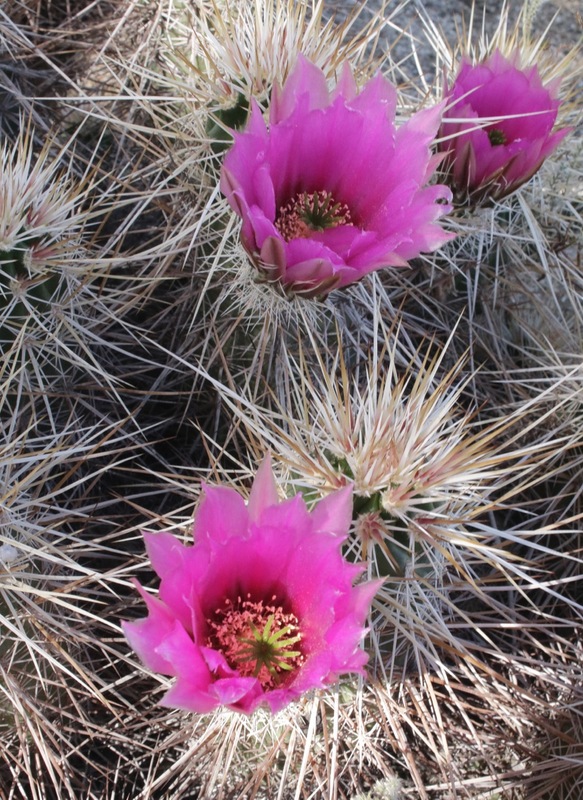 Across from the campground, we spotted some flowering cacti, parked the car and hiked the mile-long cactus loop trail. 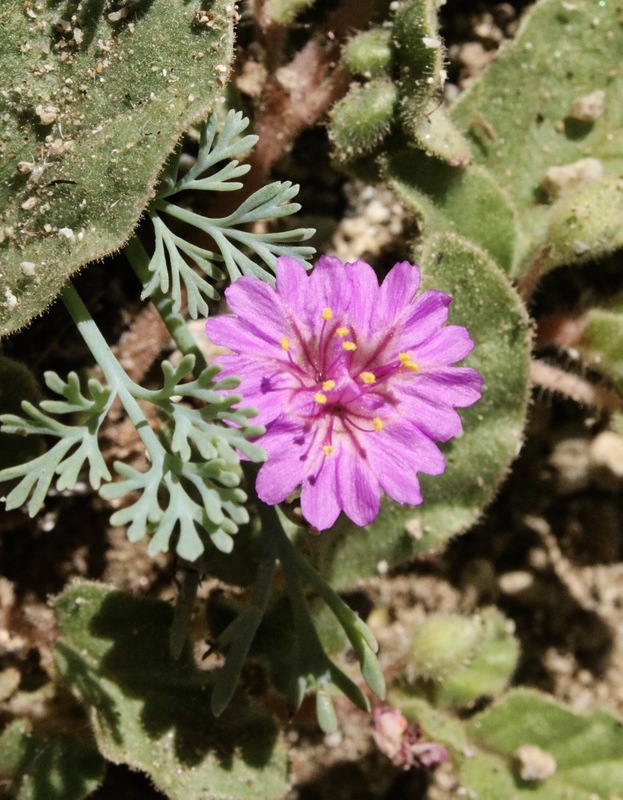 While the peak flowering month for the spiny plants is April, there was already plenty to see then (March 23). A crowd was already overwhelming the visitor center, even on a weekday. I read that the past weekend was much worse with bumper-to-bumper traffic. 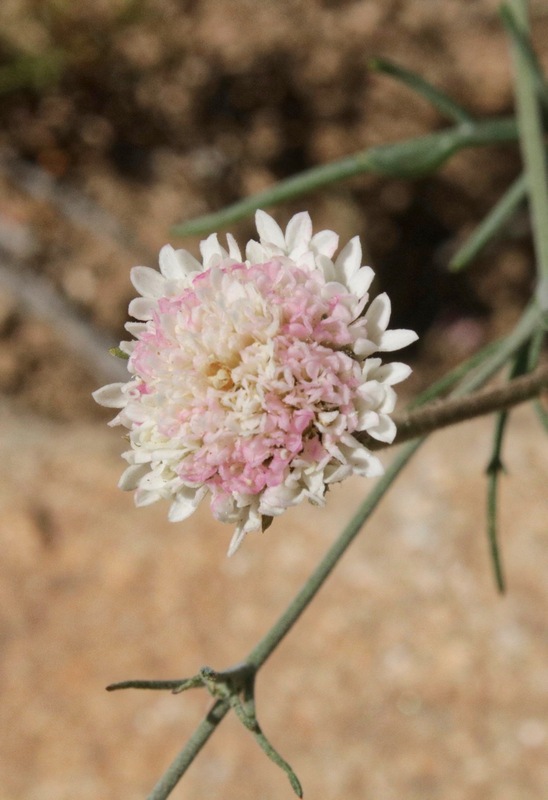 Word got out that Anza-Borrego was exploding with flowers. 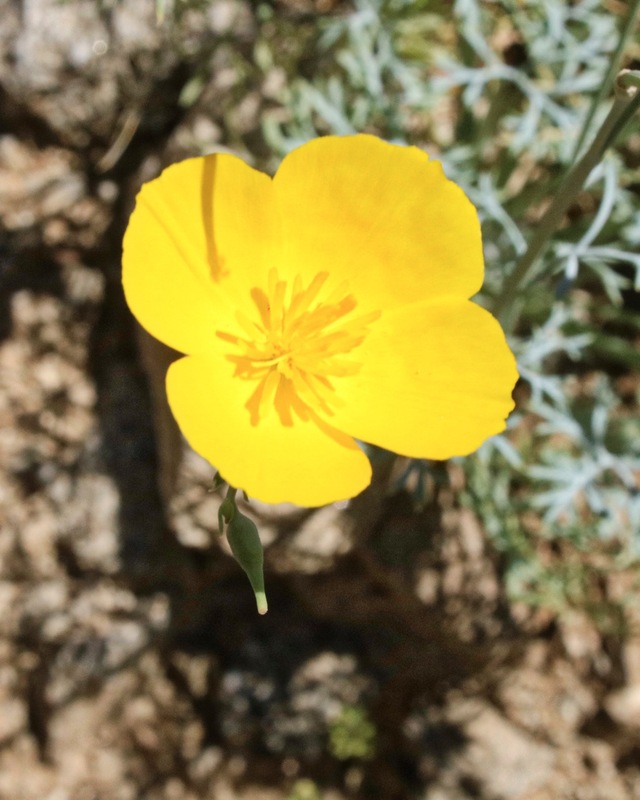 A volunteer was handing out a map that identified the best spots for wildflower-viewing. At the rear of the building, a garden with walking paths had many specimens. I wish I’d spent more time there. 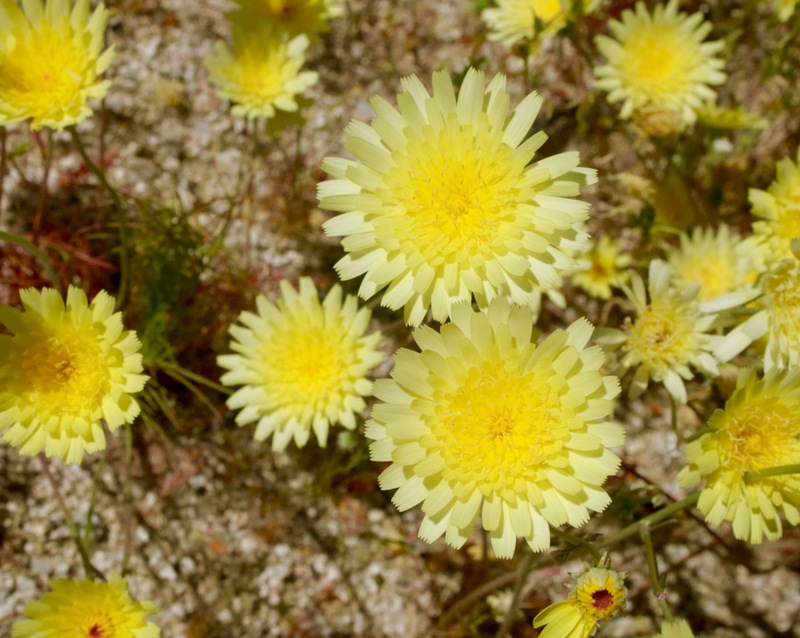 In the valley surrounding Borrego Springs, different flowers were popping up along the roadsides. In normal years, these would be easy to overlook but this year their abundance was hard to ignore: evening primroses, sand verbenas, lupines and desert sunflowers. The field of desert sunflowers along Henderson Canyon Road, in particular, was unusual in another respect: they were crawling with sphinx moth caterpillars in such numbers that I had to be careful where I stepped. These weren’t little critters either, but big, fat ones, easily 3-4″ long. 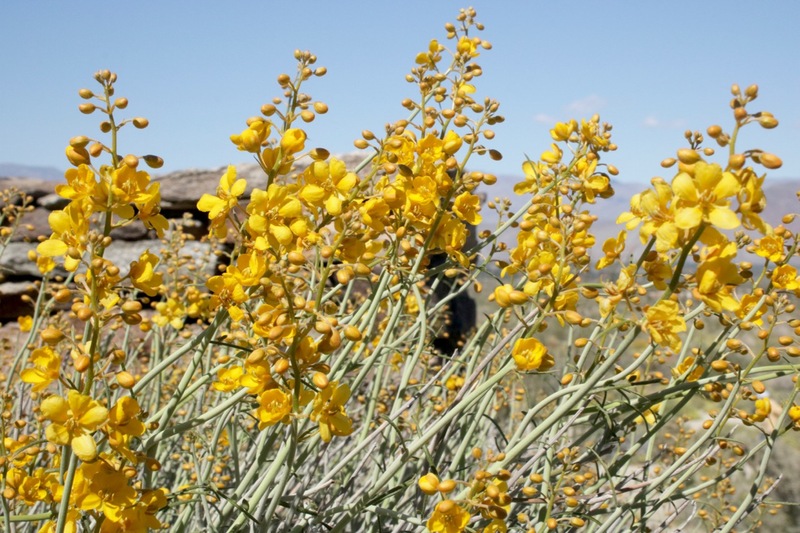 Our final outing was a hike up into the hills of Palm Canyon where the concentration of brittlebush was as plentiful as the first encounter along Hwy 78. 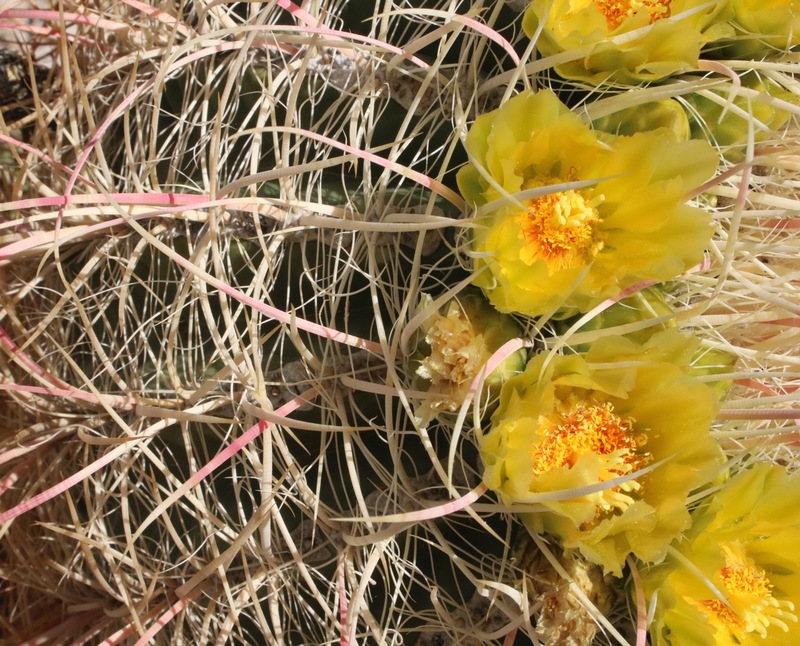 The hills were awash in yellow, with excellent specimens of ocotillo, agave and cacti for variety. The ocotillo here were more richly tipped with their red flowers than elsewhere in the park. 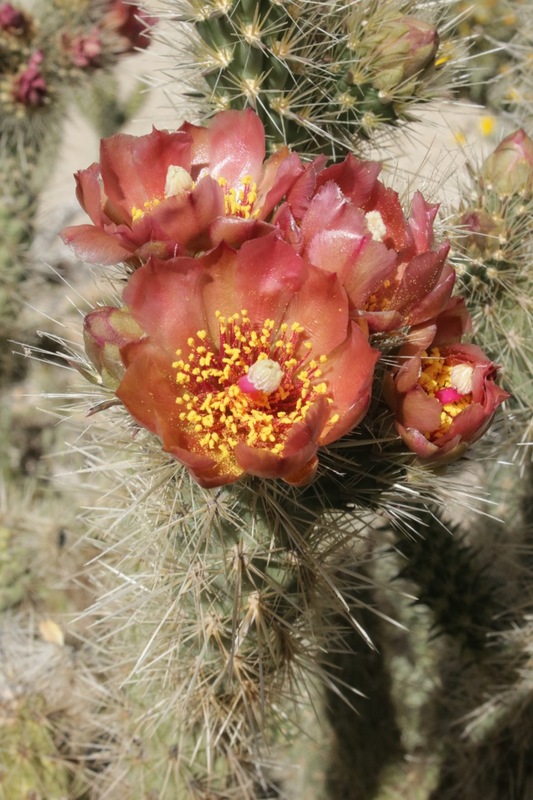 As harsh as the Mojave Desert can be, there is a rich life of plants and animals. It takes the right conditions to see them. Once in a long while, I get lucky and catch a rare glimpse of something special like a wildflower superbloom that I may never experience again. This entry was posted in California, Nature photography, Photography, travel, West Coast and tagged Anza-Borrego Desert State Park, Arizona lupine, beavertail pricklypear, brittlebush, California barrel cactus, desert dandelion, desert pincushion, desert sand verbena, desert sunflower, desert wildflowers, dune evening primrose, fishhook cactus, hedgehog cactus, hummingbird bush, indigo bush, lace-leaf phacelia, ocotillo, pima rhatany, purple mat, silver cholla, sphinx moth, spiny senna, trailing windmill, white tackstem, wildflowers, Wolf’s cholla. Bookmark the permalink. Lovely shots, you were lucky to see that much. I was also recently in the Mojave Desert, but a couple hundred miles further north. There were some flowers but not as many and not as much variety. I did hear I was about a week early. I’ve never seen so many flowers in one place, with the exception of the poppies and lupines around Lancaster many moons ago. 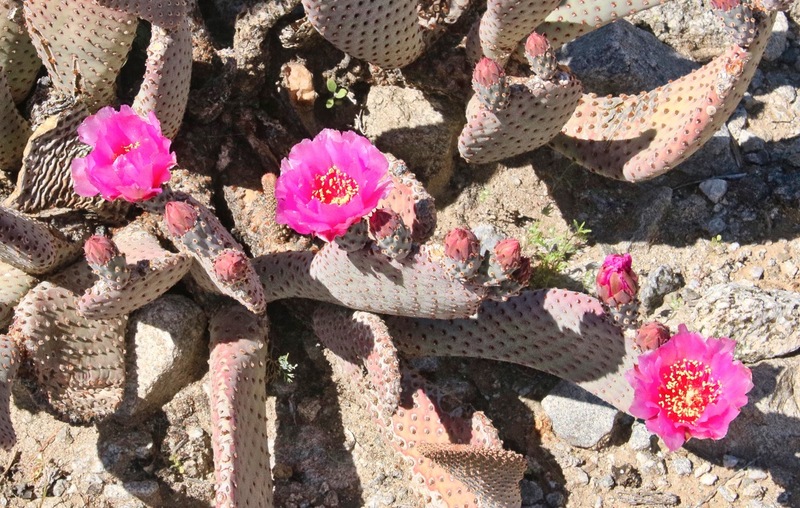 But at Anza-Borrego, the variety was astonishing.